Ulli Theeyal, is a traditional Kerala Dish, a flavourful shallot dish prepared in roasted coconut gravy. 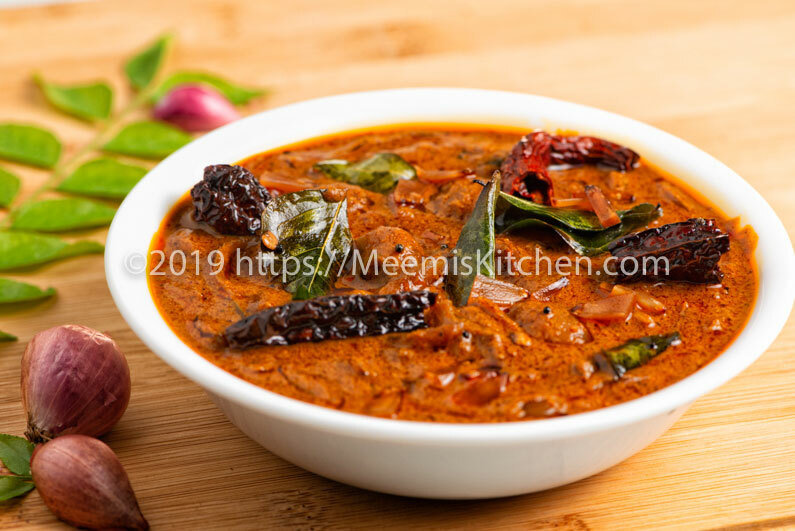 Thenga varutharacha curry/ Theeyal is extremely popular in Kerala and can be prepared with most of the vegetables like Pavakka, Brinjal, Okra, Padavalanga (Snake Gourd), Pearl Onion/ Shallots etc. and is even made with Prawns. This popular vegetarian dish is often served in Kerala sadhya, a great vegetarian spread prepared during festive occasions. A variety of dishes like Parippu curry, Avial, Sambar, Kalan, Olan, Pulissery, Vellarikka Pachadi, Kichadi, Erissery, Inji Curry, Thoran, Koottu curry, Papad, Mango Pickle, Lime Pickle, Ulli curry, Crisps, Pradhaman, Payasam etc. are served on Banana leaves alongwith rice, for Sadya. As the Lent season has started, I am preparing all vegetarian dishes and trying to make it appealing and satisfying to the picky eaters at home. I am sure many mothers will be in the same shoes trying to coax your reluctant kids dig into the veggies! Well, I can’t say I succeeded fully, as the rich brown gravy of Ulli Theeyal, failed to brighten their faces, although we grownups had a feast! From my childhood, Ulli Theeyal and Pavakka Theeyal were regular Lent dishes. The rich brown, spicy gravy and the aroma of roasted coconut and spices makes this Ulli Theeyal Irresistible. Earlier, we used to roast coriander seeds and red chillies along with coconut, but I have used roasted and ground coriander and chili powder in this recipe. 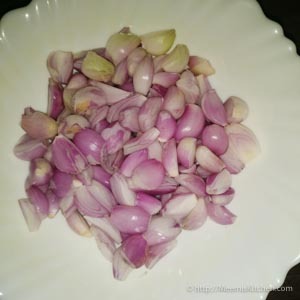 Shallots or Kunjulli theeyal is quite easy to prepare, as it does not need elaborate cooking. Roasting the coconut is the complicated part- if it is not roasted evenly, you will not get the right flavours. It is better to grind the coconut coarsely to make it even before roasting. This way, coconut will be evenly roasted, and you will get the right color. Also, Ulli theeyal should have the right consistency and flavours. Roasted coconut and Tamarind make it flavourful and aromatic. Served as a side dish for rice, Ulli Theeyal is delicious, with the perfect balance of spicy, sweet and savoury flavours! Check out this wonderful recipe and enjoy! Peel the small onions, wash and keep aside. Soak Tamarind in water. 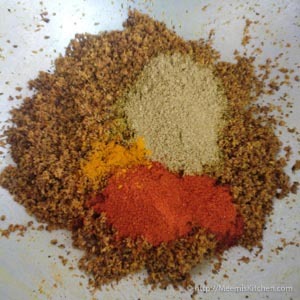 Take the grated coconut and coarsely ground in the grinder for few seconds to make it even. Heat a pan and add 1 tsp coconut oil. Put the grated (ground)coconut and few curry leaves in the pan and fry on slow fire stirring till it turns a nice brown colour. Add the Coriander Powder, Chili powder (I used Kashmiri chilli powder to get the dark color) and turmeric powder. Turn off the heat and roast for few seconds till the aroma of roasted coconut and spices starts to emanate. Allow to cool down and ground to a fine oily paste without water. Meanwhile, slice the shallots length wise into two or three pieces (leave the small ones as it is). Cut the green chilies into thin rounds. 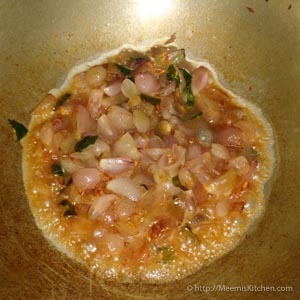 In the same pan, pour 2 tsp coconut oil and fry the green chilies and curry leaves for few seconds and add the sliced onions. Sauté for a few minutes till it becomes transparent. 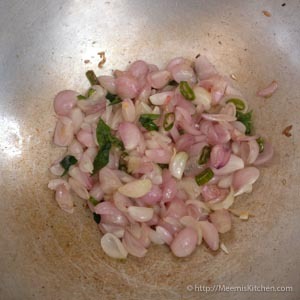 Strain and add most of the tamarind water into the pan, add salt and simmer the onions in it. Next, add the finely ground coconut paste to the pan and combine well. Let it simmer and add little hot water to get the correct consistency. The gravy should be thick and not watery. Adjust the salt and add more tamarind water if required. Let it simmer for few minutes and take off the heat. In another pan heat coconut oil, fry thinly sliced coconut strips till golden brown, drain and keep aside. Next, crackle mustards, fry curry leaves and dried red chilli and pour over the Ulli Theeyal. Garnish with coconut strips. Enjoy with rice! 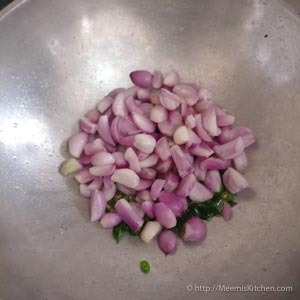 Small shallots are best for Ulli Theeyal. If you get only big ones, slice it lengthwise into two or three pieces. Grind the scraped coconut coarsely to ensure that coconut is roasted perfectly and evenly. Use coconut oil for authentic traditional taste. 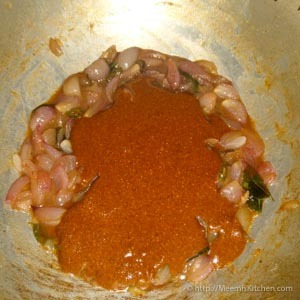 Keep the spices ready and once you add it to the browned coconut, turn off the flame to avoid burning of the spices. Kashmiri Red chili powder gives the gravy an appealing rich colour. You can add whole coriander seeds and whole red chili instead of spice powders. 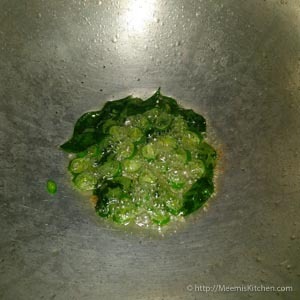 (6 – 8 Kashmiri chillies and 1 ½ tbsp coriander seeds). Do not add water while grinding the roasted coconut. 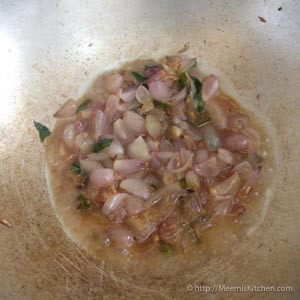 Scrape the sides and continue grinding till you get a fine oily paste. Do not add the entire tamarind water but add gradually till you get the perfect taste. Some traditional recipes suggest adding fenugreek seeds while roasting coconut, but I prefer without. Please add according to your taste. Coconut strips should be very small and thin. It gives a nutty taste to the Ulli Theeyal. However, it is optional. Hope you liked this Kerala style Ulli Theeyal recipe. It would really motivate me if you will send me your comments or share with friends through the share buttons below. God Bless!